The Beebe Estate exhibits characteristics of the transition from the Federal to the early Greek Revival style of architecture. The traditional five-bay, center-entrance massing is reminiscent of the Federal style, while the portico with fluted Doric columns, high, flat entablature, and pedimented roof exhibit Greek Revival-style elements. The building has wood clapboard siding with narrow flat cornerboards, fascia, and window surrounds. Topping the structure is a central cupola. The polygonal base supports a cylindrical ring of six fluted ionic columns. The entablature of the cupola features carved wreaths, dentils, and anthemion antefix. A significant element of the house is the ornamental balustrade along the base of the hipped roof. An ‘X’ pattern spans between panels accented with an acroteria motif in a scroll and anthemion pattern at the center and corners. Recent paint analysis showed that while the earliest layers of paint on the body of the house date to c1828, the paint layers on the cupola are no earlier than c1845-1855, suggesting that it was added at that time. The house includes the main block and a rear kitchen ell. Turn-of-the-century photographs show the main part of the house looking much as it does today. But an undated photo (probably from the late 19th century) shows that the rear ell was once somewhat narrower than its present size and had a one-story lateral porch facing the garden. This feature had been removed and the house had reached its present size and appearance by the early 20th century. By the mid-1990s, the house was in need of extensive maintenance and repair. It had been determined that a whole new roof system was required, as well as restoration of the cupola and balustrade, and complete exterior painting. In 1996, with the encouragement of Mayor Richard Lyons, the Beebe Estate Association was created for the purposes of preserving and promoting the house as a vital community resource. Melrose’s Office of Planning and Community Development began applying for grant money to preserve the house. With the help of State Representative (and later Mayor), Patrick Guerriero, State Senator Richard Tisei, and interim Mayor Ron Alley, sufficient grant money was obtained for both the preservation of the house and the restoration of the gardens on the east side of the house. 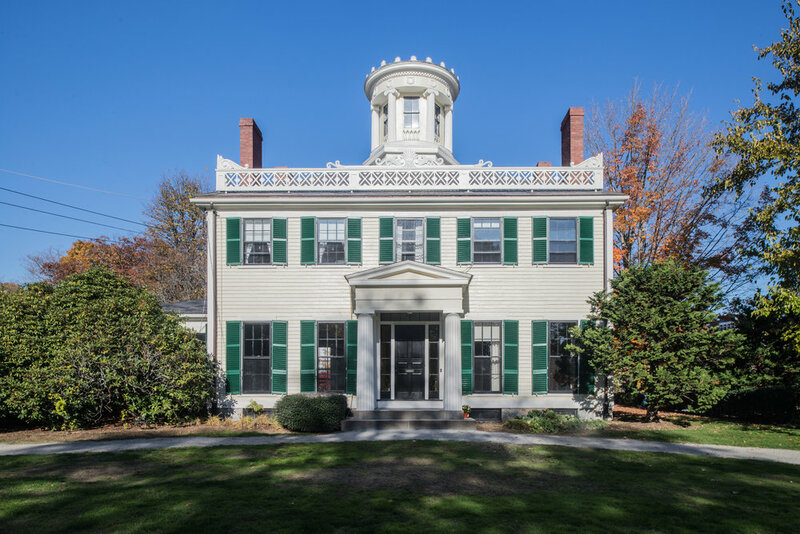 The Massachusetts Preservation Projects Fund, a state matching-grants program, helped finance the house’s restoration, and a preservation restriction placed on the property in perpetuity helped ensure that the Beebe Estate’s historic character would be maintained into the future. Construction began in the fall of 1998 and was completed the following spring. The Council on Aging office relocated from City Hall to the house’s former kitchen, in the first-floor rear ell, where it remains today. Other nonprofits moved into the house’s former bedrooms upstairs, and the downstairs parlors and dining room became space for art shows, rentals, and other events and activities, under the oversight of the newly formed Beebe Estate Board of Trustees. In 2013, after a large snowstorm, a portion of the building’s iconic balustrade on the east side of the house became dislodged. Upon further investigation, it became apparent that significant portions of the balustrade had begun to rot. Another preservation project was planned, and work began in 2013. The existing balustrade was painstakingly documented in photographs and measured drawings. The balustrade was removed, and the appropriate treatments were made in the carpenter’s shop. Wherever possible, existing original elements were retained and repaired. In locations where the damage was too great, new balustrade elements of durable mahogany were created, duplicating the original in size and profile. The restored balustrade was reinstalled in early spring 2014. A character-defining feature of the Beebe Estate was again in place. In 2015, the Trustees hired preservation consultant Sara Chase to undertake a paint analysis on the Beebe in anticipation of doing some additional minor carpentry repairs and repainting. With the assistance of staff from the Melrose DPW, Sara took samples from numerous places on the building. Ultimately, the original colors were revealed to be a cream color with green shutters. Sara's color chronology and sleuthing also revealed that neither the cupola nor the balustrade appear to be original to the building, but were added sometime early in the building's history. In the Spring of 2016, funds allocated to the Beebe by the state legislature allowed for the transformation of the Beebe from the familiar white to its new, old hue. Extra funds were used to complete some much-needed interior painting as well as the transformation of a storage closet into a kitchenette. Project management was provided by the city Engineering Division staff.